May your trails be crooked, lonesome, dangerous, leading to the most amazing view. May your mountains rise above the clouds. Well, the uprising in Colon has settled down, Superstorm Sandy has moved on, but Chris and I are still here at Shelter Bay Marina in Colon dealing with ongoing battery problems. While we're here waiting for parts, we've had the chance to explore the rustic Caribbean coast of Panama. The area we've explored in northern Panama ranges from slightly west of Colon, across the canal and east to Portobelo, and further yet along the coast to the tiny towns of Puerto Lindo and Garotte (neither of which are on the map). We went on a 12 mile round trip bike ride deep into the rainforest. 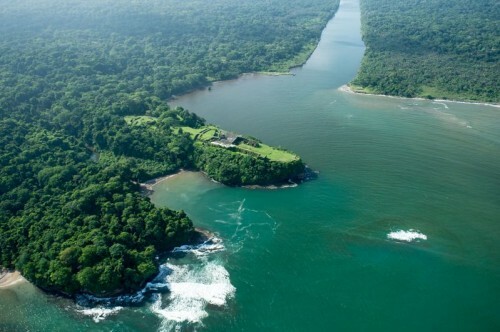 Our destination was the San Lorenzo Fort, shown above at the mouth of the great Chagres River. It is the oldest fort in Panama. howler monkeys was an armadillo. Who knew they lived in the tropics? recent uprising and shootouts with police, where many were killed, including two children. As usual you have captured the essence of Panama!